Download "English National Concessionary Travel Scheme (Free) Bus Pass General Frequently Asked Questions"
2 3. Who decides who is eligible? Government legislation determines the age at which older men and women become eligible for a pass. The County Council decides on disability eligibility, taking into account the legislation and Government guidance on how the law should be interpreted. 4. 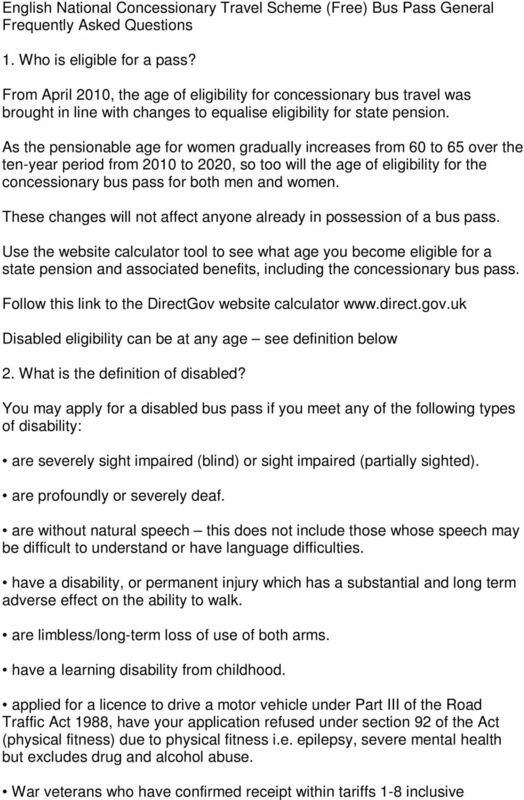 How do I apply for an older persons, or disabled pass? From June 2013 you can renew online at Alternatively, you can collect an application form at your local library, district council office, travel/tourist information centre, bus/rail station, or you can contact the Customer Service Centre on This will provide full instructions on how to complete your form and what your need to prove your eligibility. 5. When can I apply? You can only apply when you are eligible. Applications for the older person will be accepted up to seven days before this date but a pass will only be processed from the date you become eligible. 6. How long is my pass valid for? Up to five years from the date of issue. The expiry date will be shown on the pass. 7. How do I renew my pass when it expires? 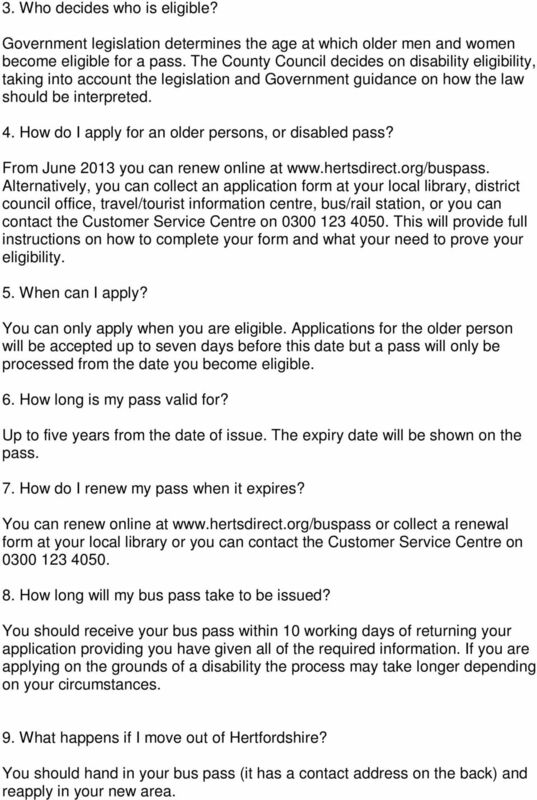 You can renew online at or collect a renewal form at your local library or you can contact the Customer Service Centre on How long will my bus pass take to be issued? You should receive your bus pass within 10 working days of returning your application providing you have given all of the required information. If you are applying on the grounds of a disability the process may take longer depending on your circumstances. 9. What happens if I move out of Hertfordshire? You should hand in your bus pass (it has a contact address on the back) and reapply in your new area. 3 10. If I am disabled and need a companion to travel? You should only apply for a disabled pass with companion facility if you are unable to travel by bus without the assistance of another person due to a medical or mental health condition. If your disability is considered to require a companion, your pass will be issued with a letter C on it 11. 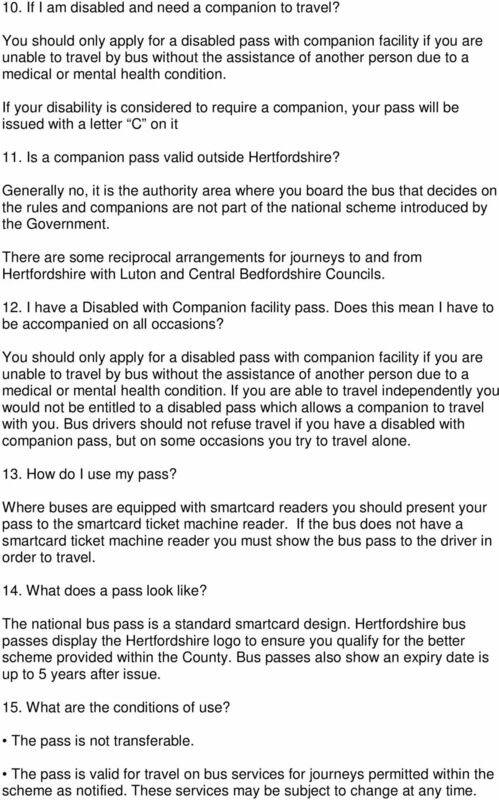 Is a companion pass valid outside Hertfordshire? Generally no, it is the authority area where you board the bus that decides on the rules and companions are not part of the national scheme introduced by the Government. There are some reciprocal arrangements for journeys to and from Hertfordshire with Luton and Central Bedfordshire Councils. 12. I have a Disabled with Companion facility pass. Does this mean I have to be accompanied on all occasions? You should only apply for a disabled pass with companion facility if you are unable to travel by bus without the assistance of another person due to a medical or mental health condition. If you are able to travel independently you would not be entitled to a disabled pass which allows a companion to travel with you. Bus drivers should not refuse travel if you have a disabled with companion pass, but on some occasions you try to travel alone. 13. How do I use my pass? Where buses are equipped with smartcard readers you should present your pass to the smartcard ticket machine reader. If the bus does not have a smartcard ticket machine reader you must show the bus pass to the driver in order to travel. 14. What does a pass look like? The national bus pass is a standard smartcard design. Hertfordshire bus passes display the Hertfordshire logo to ensure you qualify for the better scheme provided within the County. Bus passes also show an expiry date is up to 5 years after issue. 15. What are the conditions of use? The pass is not transferable. The pass is valid for travel on bus services for journeys permitted within the scheme as notified. These services may be subject to change at any time. 5 Community Transport 18. Are there time differences outside Hertfordshire? Yes. The pass can be used on off-peak services in England (09.30am to 11.00pm Monday to Friday and anytime at weekends and Bank holidays), except where there are local decisions to extend these hours. 19. Why are there differences in a national scheme? The English pass can always be used on off-peak services (09.30am to 11.00pm Monday to Friday and anytime at weekends and Bank holidays) but there is local discretion to extend these. Hertfordshire County Council exercises this discretion but many areas do not. 20. Can I use my pass anywhere in the UK? No, only in England 21. Can I use it on trains, trams or the tube? No 22. Can I use my pass on National Express coaches? No, but National Express may offer their own discount scheme. 23. Can I use my pass on Green Line? Yes, but there are time restrictions on journeys to central London. 24. Can I use my pass on dial a ride and community transport? No, unless there are specific arrangements locally to include it in the scheme. 25. If I have no bus service can I apply for any alternative to a pass? No 26. Are there any other discounts on trains? 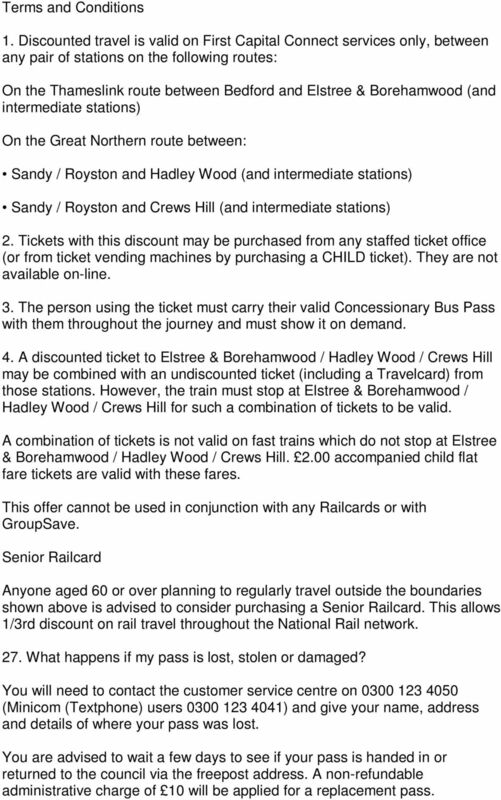 First Capital Connect Concessionary Fares Scheme Hertfordshire Holders of Hertfordshire bus passes may obtain a 50% discount on rail fares for travel wholly in Bedfordshire and / or Hertfordshire on the routes shown below. This applies after 10:00 Mondays to Fridays and all day on Saturdays, Sundays and Bank Holidays. 6 Terms and Conditions 1. Discounted travel is valid on First Capital Connect services only, between any pair of stations on the following routes: On the Thameslink route between Bedford and Elstree & Borehamwood (and intermediate stations) On the Great Northern route between: Sandy / Royston and Hadley Wood (and intermediate stations) Sandy / Royston and Crews Hill (and intermediate stations) 2. Tickets with this discount may be purchased from any staffed ticket office (or from ticket vending machines by purchasing a CHILD ticket). They are not available on-line. 3. The person using the ticket must carry their valid Concessionary Bus Pass with them throughout the journey and must show it on demand. 4. A discounted ticket to Elstree & Borehamwood / Hadley Wood / Crews Hill may be combined with an undiscounted ticket (including a Travelcard) from those stations. However, the train must stop at Elstree & Borehamwood / Hadley Wood / Crews Hill for such a combination of tickets to be valid. A combination of tickets is not valid on fast trains which do not stop at Elstree & Borehamwood / Hadley Wood / Crews Hill accompanied child flat fare tickets are valid with these fares. This offer cannot be used in conjunction with any Railcards or with GroupSave. Senior Railcard Anyone aged 60 or over planning to regularly travel outside the boundaries shown above is advised to consider purchasing a Senior Railcard. This allows 1/3rd discount on rail travel throughout the National Rail network. 27. What happens if my pass is lost, stolen or damaged? You will need to contact the customer service centre on (Minicom (Textphone) users ) and give your name, address and details of where your pass was lost. You are advised to wait a few days to see if your pass is handed in or returned to the council via the freepost address. A non-refundable administrative charge of 10 will be applied for a replacement pass. 7 *If your permit has been stolen and you are able to provide a valid Police crime number, the fee will be waived. * Payment can be made by cheque, debit or credit card only. Cash and Postal orders are not accepted. A replacement should be issued within ten working days from the date the non-refundable charge is paid to the council. 28. Is there a telephone number for further pass queries? You can contact the Concessionary Travel Team at the Customer Service Centre on (Minicom (Textphone) users ). 29. How do I find out information on bus services? Within Hertfordshire the Intalink Partnership provides a range of information. Visit their website at for more details. For information for services across the rest of the country you can contact the Traveline Information Service, which can be telephoned between 7am and 10pm daily on (calls cost 10p per minute from landlines), or alternatively visit their website at What can I do if buses don t run or are unreliable? The concessionary scheme does not guarantee that you will get any particular level or quality of service provision. You may wish to take up issues or complaints with the operator if you are dissatisfied. 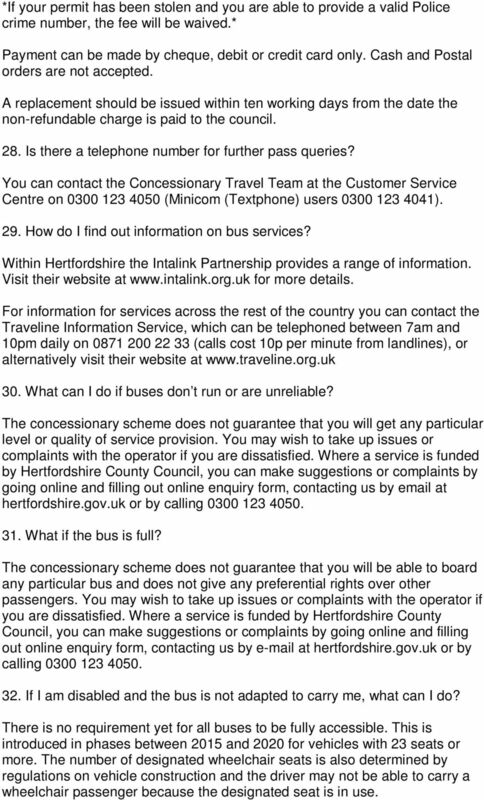 Where a service is funded by Hertfordshire County Council, you can make suggestions or complaints by going online and filling out online enquiry form, contacting us by at hertfordshire.gov.uk or by calling What if the bus is full? The concessionary scheme does not guarantee that you will be able to board any particular bus and does not give any preferential rights over other passengers. You may wish to take up issues or complaints with the operator if you are dissatisfied. Where a service is funded by Hertfordshire County Council, you can make suggestions or complaints by going online and filling out online enquiry form, contacting us by at hertfordshire.gov.uk or by calling If I am disabled and the bus is not adapted to carry me, what can I do? There is no requirement yet for all buses to be fully accessible. This is introduced in phases between 2015 and 2020 for vehicles with 23 seats or more. The number of designated wheelchair seats is also determined by regulations on vehicle construction and the driver may not be able to carry a wheelchair passenger because the designated seat is in use. 8 If you consider that the driver has not acted reasonably, you may wish to take up issues or complaints with the operator. Where a service is funded by Hertfordshire County Council, you can make suggestions or complaints by going online and filling out online enquiry form, contacting us by at hertfordshire.gov.uk or by calling Does the bus driver have to give me a ticket? 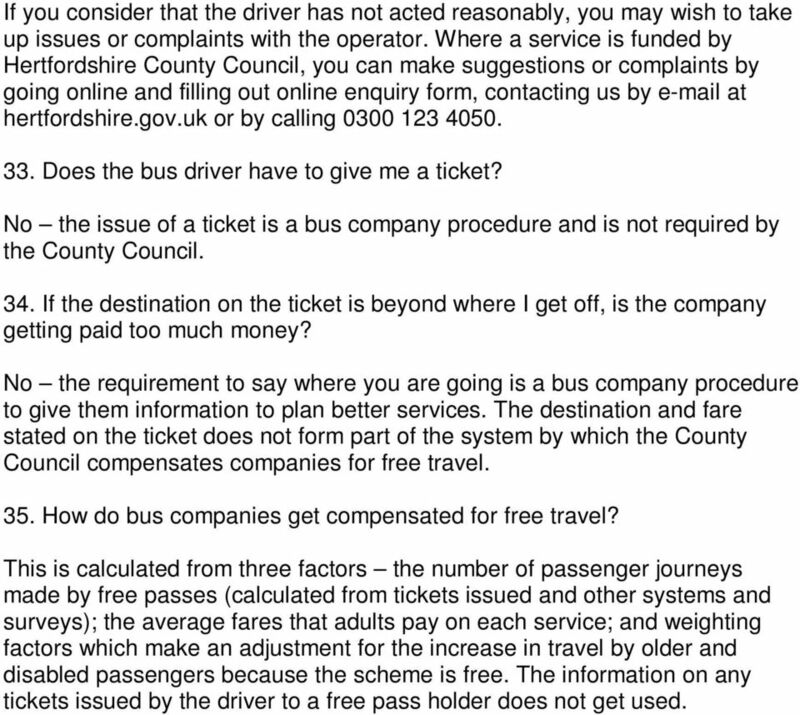 No the issue of a ticket is a bus company procedure and is not required by the County Council. 34. If the destination on the ticket is beyond where I get off, is the company getting paid too much money? No the requirement to say where you are going is a bus company procedure to give them information to plan better services. The destination and fare stated on the ticket does not form part of the system by which the County Council compensates companies for free travel. 35. How do bus companies get compensated for free travel? This is calculated from three factors the number of passenger journeys made by free passes (calculated from tickets issued and other systems and surveys); the average fares that adults pay on each service; and weighting factors which make an adjustment for the increase in travel by older and disabled passengers because the scheme is free. The information on any tickets issued by the driver to a free pass holder does not get used. Rail travel made easy. 1/3 off rail fares for you and a friend! BASIC GUIDE TO ACCESSIBLE TRANSPORT IN THE COUNTY & BEYOND - How to get out and about! Train times. northernrail.org. Manchester to Stoke-on-Trent via Macclesfield. 13 December 2015 14 May 2016. Manchester Piccadilly. Train times. northernrailway.co.uk. Manchester to Stoke-on-Trent via Macclesfield. 15 May 10 December 2016. Manchester Piccadilly. Driving after stroke. Key points. Why can t I drive immediately after having a stroke? Stroke Helpline: 0303 3033 100 Website: stroke.org.